Although they borrow their moniker from the capital city of the country of Belarus, Minsk actually hail from Peoria, IL, of all places, where the bandmembers began working on demos circa 2002, inspired by a cross section of ancient doom and futuristic post-metal that was growing quite popular at the time thanks to the emergence of groups like Isis, Cult of Luna, and Rwake. For Minsk, distinction from the pack would emanate from their unusually percussive approach, a consequence of the complex interplay between vocalist, keyboardist, and conga player Tim Meade and drummer Anthony Couri (later replaced by Tony Wyioming). Rounded out by guitarists Chris Bennett and Dustin Addis, the band began recording its debut album, Out of a Center Which Is Neither Dead Nor Alive, in 2005. When their original bass player quit midway through the sessions (soon to be followed by Addis), producer Sanford Parker — also guitarist with Buried at Sea — helpfully stepped into the breach and has continued to split his time between both bands ever since. As for Minsk, their budding promise and powerful live performances in support of bands like Brutal Truth, High on Fire, and Sunn 0))) soon earned them a contract with Relapse Records, which released their sophomore opus, The Ritual Fires of Abandonment, in 2007. 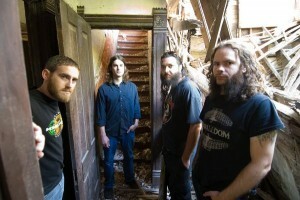 After additional rounds of touring, this was followed two years later by a split EP with labelmates Unearthly Trance, and then by Minsk’s third album, With Echoes in the Movement of Stone.